Although a few black slaves and freemen had lived in Ridgefield in the 18th and early 19th Centuries, the first home-owning black family to settle here may have been the Steeles of Farmingville. 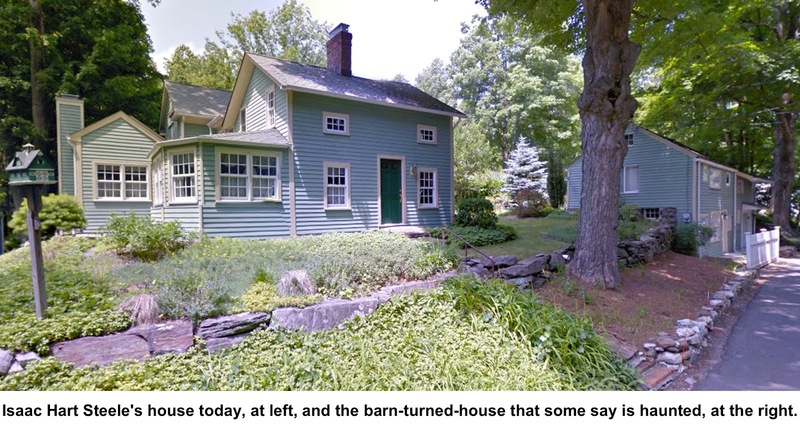 According to research done by Keith Jones for his book, “The Farms of Farmingville,” in 1865 Isaac Hart Steele of North Salem, N.Y., paid $300 to William Lee for a small, already antique house on two acres along what is now Limekiln Road. Located just south of Poplar Road, the house still stands today. Jones says there were indications the Steele family may have been living there as early as 1859. That is when his daughter, Mary E. Steele, was born to his first wife, Sarah A. Steele. Sarah died in 1862 at the age of 32, and by 1865 when the the house purchase took place, Isaac was married to Catherine “Katie” Pines Steele. Isaac Hart Steele’s home sat on two acres of limestone ledge, making it unsuitable for farming, Jones said. To earn an income, Steele worked on neighboring farms, including that of Azariah Smith. Apparently his abilities at farming gained a reputation for excellence because Steele was hired to oversee the fields on Gov. George E. Lounsbury’s large farm, The Hickories. His wife, Katie, may have worked as a member of the household staff at The Hickories, Jone said. Her step-daughter, Mary, may also have worked for the governor; when she died in 1933, her occupation was listed as “servant” in the town’s death records. Mary E. Steele was born in 1859, possibly in the Limekiln Road house, and attended school in the old Farmingville Schoolhouse near the site of today’s Farmingville School. She told an interviewer in the 1920s that her ancestors had lived in the North Salem area since the 1700s, and recalled hearing her great-grandmother tell of attending a gathering in North Salem during the Revolution when General Washington and General Lafayette and their staffs stopped for refreshments on their way to Hartford. Aunt Sibby Sickle had also been present when the French Army under General Rochambeau passed through North Salem and Ridgebury. Town Historian Richard E. Venus knew Mary Steele in her later years. She was “a nice little old lady that everyone thought the world of,” he recalled in 1983. “She was a very pleasant and cultured person. The Steele family belonged to St. Stephen’s Church. Katie Steele died in 1889. Three years later, Isaac Hart Steele sold the Farmingville property for $712, more than twice what he paid, and bought a place on Danbury Road near where Adam Broderick is now. He lived there for a while, eventually returning to North Salem, where he died in 1921 at the age of 87. Mary remained in Ridgefield, living in an apartment over a store on Main Street, a little north of where Books on the Common is now. In January 1932, she was asleep when a fire broke out in a nearby apartment. She was rescued by firefighters. She died nearly two years later, in December 1933, at the age of 75. Mary, along with father Isaac, mother Sarah and step-mother Katie, are buried with other members of the Steele family in the historic June Cemetery on June Road in North Salem. The old Steele homestead on Limekiln Road included a barn, now converted into a house, that stands only a couple of feet from the edge of the road’s pavement — perhaps closer to a road than any house in town. Keith Jones reported that he was told by a former owner that a mid-1980s town road crew worker was “reluctant to enter the building, reciting local tradition that the attic was haunted by the ghost of an old, white-haired man who could be seen hovering behind [the] gable window. “Perhaps, the attic ghost — if there really is one — is the heart-broken spirit of Hart Steele in search of his wife, Catherine, both of whom barely scratched a living from this small, limestone infested property,” Keith Jones wrote.